Steven P. Singson, D.O. - David S. Weingarden, M.D. & Associates, P.C. Dr. Singson was born and raised here in Macomb County, Michigan! His parents are both physicians that have been serving the community of Macomb County for over 30 years! Dr. Singson is an athlete that enjoys outdoor sports including running and basketball. He is a welcome new addition to our medical group. 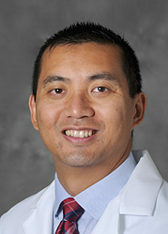 Dr. Singson obtained his Bachelor of Science from the University of Detroit in 2000 and his Master of Science from Wayne State University in 2003. He received his Doctorate of Osteopathic Medicine from Des Monies University in 2008 and completed his residency in Physical Medicine and Rehabilitation at the University of Toledo Medical Center. Dr. Singson is a member of the prestigious American Academy of Physical Medicine and Rehabilitation and is Attending Medical Staff at Henry Ford Macomb Hospital. Dr. Singson continues in his physician parents footsteps, serving faithfully the community of Macomb County. Dr. Singson has recently been awarded “A Top Physiatrist Award” by the International Association of HeathCare Professionals (IAHCP) in 2018. And is spotlighted in The Leading Physicians of the World publication. Dr. Steven P. Singson, D.O.